We're almost halfway through November (hard to believe) and the holidays are coming up which means some time off from work and school, and families are planning get-togethers in the upcoming months. Have you thought about spending some quality family time at the beach? You might think that summer is the only time to plan a beach getaway for the family, but it's not. It is a wonderful time of year to be here in Emerald Isle. The beaches are uncrowded, the autumn colors are vibrant, and the coastal scenery is as stunning as ever. Plan ahead to do some holiday shopping while strolling the waterfront towns of Beaufort, Morehead City, and Swansboro, which are all an easy drive from Emerald Isle. Try one of our local restaurants or spend the day at a historic site or two. The possibilities are endless! Gather up the family, pack up the car, and take a road trip to the Crystal Coast for a few days. Plan ahead and spread the word to your extended family and make it a family reunion at the beach. 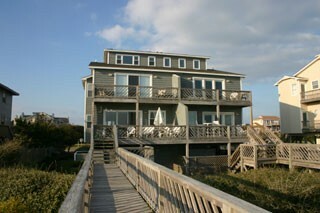 There are many spacious Emerald Isle vacation rentalsto choose from with plenty of room for you and all of your family. Choose the amenities that suit your needs. Many of our rentals have decks with ocean views, grills for a family cookout, games and entertainment options for the kids, and so much more. In addition to all of the great selections, there are seasonal specials and discounts on Emerald Isle accommodations. Be sure to check out the local events that are occurring during your stay. If you're here this weekend, stop by the Jumble Sale at the Beaufort Historic Site on Saturday, November 17. The site transforms into a community market rich with handmade goods, arts and crafts, holiday gifts, pre-loved treasures, antiques, clothing, and so much more. Get a head start on your holiday shopping right here. The Jumble Sale has no admission fee and runs from 9a.m. to 3p.m. Also worth a visit this weekend is the Beaufort Historical Association's (BHA) Community Thanksgiving Feast held at the Beaufort Historic Site on Sunday, November 18 from 11:30a.m. to 1p.m. It's your chance to begin celebrating Thanksgiving early with a traditional turkey dinner served with all of the fixings in a historic waterfront setting. The feast is provided by some of the local fine dining establishments in the area. It's a real treat! Dinners are available for take-out or can be enjoyed on the grounds of the historic site under their tent. Tickets are $18 in advance and $20 the day of the event. Hurry, this event sells out quickly! We'll keep you posted on the upcoming events here on the Crystal Coast. Please know you have a standing invitation to join us in the upcoming weeks. We'd love to see you! 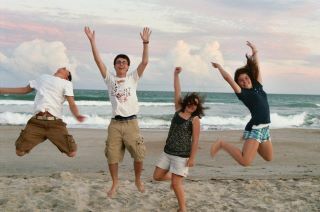 Have you and your family enjoyed an off-season beach getaway in Emerald Isle? Tell us about it in our comment section. We'd love to hear about it!